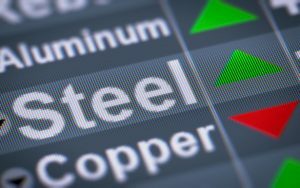 This morning in metals news, Chinese steel prices are not running in the same direction as the Chinese stock market, copper hit a two-week high and automaker shares were up on yesterday’s NAFTA news. The Chinese stock market has been on the decline, but steel prices aren’t following suit, as CNBC reported. The Nanhua rebar steel futures index is up 22% this year, while the Shanghai composite is down 16%, according to the report. MetalMiner’s Take: From a domestic steel price perspective, the health of the Chinese economy remains less critical than the actual prices of Chinese steel. From a short-term perspective, buying organizations should pay much more attention to actual steel prices in China as opposed to the Chinese stock market, PMI or overall GDP numbers because they tend to lead domestic steel prices. The Chinese government will do its part to shore up the economy to keep China growing at 6.7 -6.8% GDP annually, despite the tariff situation. Meanwhile Chinese domestic steel prices — at least for HRC, CRC and HDG — remain on the rise. Copper prices showed signs of upward movement Tuesday, hitting a two-week high, Reuters reported. LME copper rose 0.3% Tuesday and has risen nearly 6% since it hit a 15-month low Aug. 15, according to the report. Automaker stocks were up Monday on the heels of the announcement of a preliminary deal between the U.S. and Mexico regarding certain provisions of NAFTA, Bloomberg reported. General Motors and Fiat Chrysler were up 4.8%, while Ford jumped 3.2%, according to the report. MetalMiner’s Take: The North American automotive supply chain is a traditional sandwich with part suppliers, assemblers and OEMs in Canada, America and Mexico. The deal announced so far is more an open danish — just Mexico and the U.S. That is great news for automakers working across the Mexico-U.S. border. However, there is a large part of the equation still to be resolved: Canada. All the same, the Mexico deal — caveat details will be in the small print — heaps pressure on Canada to come to a deal. At least for automakers, the NAFTA renegotiation appears to be paying off.